DONETSK, Ukraine -- Intensifying gunfire and explosions rocked Donetsk again Sunday as Ukrainian forces fought to complete the encirclement of pro-Russia insurgents in their largest remaining stronghold. Amid warnings by the rebels of civilian suffering, Russia said it was in talks with Kiev and international agencies about delivering humanitarian relief to the rebel-held ciites. Overnight, troops advanced to "tighten the ring" around Donetsk, destroying "a large quantity of armor" and killing many insurgents, the Ukrainian command said. The Donetsk city council said that during a "massive bombardment from heavy weapons," shells hit an outpatient clinic, a private house and other civilian infrastructure, injuring one woman. The separatists said they are turning Donetsk into a military camp and described conditions in the city as dire. They also warned of "a large number of casualties should the city be stormed," according to a statement by Alexander Zakharchenko, the new prime minister of the self-proclaimed Donetsk People's Republic. "We are ready for a cease-fire to prevent the growth of the humanitarian catastrophe," he said. City streets were deserted Sunday, and even the previously ubiquitous insurgents seem to have retreated from view. Some analysts interpreted the statement as an appeal to Kiev to stop its offensive, which has given Ukrainian forces a big advantage over the rebels. But separatist leaders quickly played down any talk of a truce. "We aren't talking about a global cease-fire, just cessation of hostilities along humanitarian corridors," said Sergei Kavtaradze, a member of the separatists' security council and an aide to Alexander Borodai, a Russian who stepped down as leader in Donetsk last week in a bid to counter Western charges that Moscow was controlling the rebels. 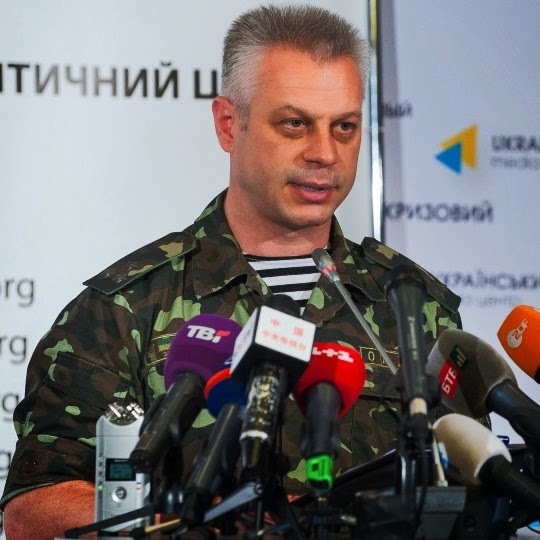 Officials in Kiev described the request for a cease-fire as empty talk. "If there is an intention [to stop fighting] it should be supported with actions, not only with words—arms to be laid down, white flags to be risen, and then no one will fire at them," said Colonel Andriy Lysenko, a military spokesman. Russian Foreign Minister Sergei Lavrov said Sunday that he was talking with Ukraine, the International Committee of the Red Cross and the United Nations to arrange delivery of relief supplies to the rebel-held cities. He said Luhansk, the second-largest rebel-held city, has neither running water nor electricity and the hospitals are running out of supplies. "All this is a sign of the most acute humanitarian situation," he said, adding that he hoped to reach an agreement shortly. The separatists have long sought to paint the humanitarian situation as bad in the hopes of triggering a Russian military intervention that could unfold under the auspices of protecting civilians. Both Kiev and Washington have said that any Russian military incursion into Ukraine under the pretext of protecting civilians would be viewed as an invasion. In Kiev, President Petro Poroshenko said he is ready to allow humanitarian aid into rebel-held territory, but only if the mission is international, unarmed and enters via Ukraine-controlled checkpoints. Mr. Poroshenko outlined the conditions in a phone call with German Chancellor Angela Merkel, according to his office. Ukraine officials say Russia has attempted to supply rebels with arms, men and ammunition under the disguise of humanitarian aid passing through the border into the rebel-held territory. Russia, as always, denies any and all allegations. Meanwhile in Kiev, city officials said they had cleared most of the remaining protesters' tents from Independence Square, the focal point of antigovernment protests last winter that led to President Viktor Yanukovych's ouster, which in turn set off the unrest in eastern Ukraine. Dozens of tents were left behind even after the new government came to power, blocking a main traffic artery. Thousands of local residents, many of whom had helped to raise the tents and barricades, came to help the cleanup over the weekend. Some protesters still living on the square reacted violently, but enough tents were cleared to allow the road to be reopened. "It was right to come and build the barricades back then, and it's equally right to clean the square now," one woman said on Ukrainian television.